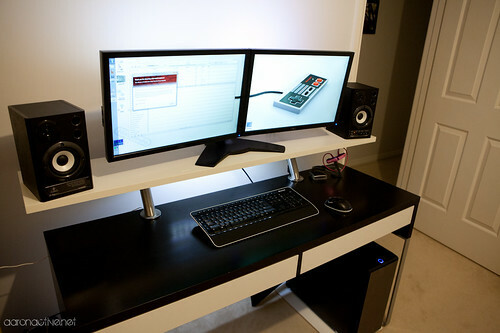 I had bought an Ikea MICKE Desk awhile back because it was pretty simple, had some good drawer space and more importantly, hidden cable management! 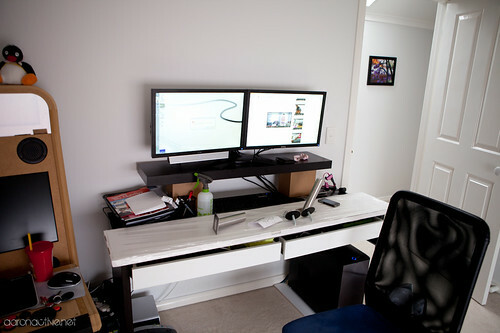 The only downside to this desk was its depth. Unless you used a laptop or something on it, there really wasn’t much space at all. My idea started off as to use an extra shelf. Raised, so I could place the monitors on it and gain much needed desk space underneath back. I had a LACK wallshelf hanging around so I played around with that first, to get an idea of what would work. So all I needed, was some brackets to raise the shelf up..and the shelf it self. Ended up settling on the CAPITA brackets and the EKBY AMUND shelf. Here was the final result, at a cost of under $65 AUD. Pretty good for more functionality, looks decent as well! If you’re interested and want to see the progress shots on how it was all put together, check out the flicKR set here. Interested in peoples thoughts on this! Let me know what you think.